Meanwhile, some Visionaries eluded the currents and fashions of painting in their own times, giving rise to such anachronistic 'Adam figures' as Goya - his solipsistic murals painted onto the walls of 'the house of the deaf man'; the unending vistas and landscapes of John Martin; Böcklin's Isle of the Dead; Fuseli's theatrical compositions; the light-infused etchings of Gustave Doré and - towering above them all - William Blake with his watercolours or etchings of the Ancient of Days, the Book of Job, the Last Judgement, and more - all accomplished with little or no recognition. Under the broader heading of Mannerist art, many Visionaries after the Renaissance may be numbered, though their names are little known today: Bartholomäus Spranger, Wendel Dieterlin, Jacques Callot, Antoine Caron, Monsu Desiderio, and Giovanni Battista Piranesi among others. In the last two hundred years, there emerged the Pre-Raphaelite Brotherhood in England, and the Symbolist and Decadent Movements of France and Belgium. From the former, Dante Gabriel Rossetti and Edward Burne-Jones; from the latter, Fernand Khnoff, Felicien Rops, Carlos Schwabe, and the still-unrecognized masterpieces of Jean Delville. Our art has also been enriched by the later Symbolists - Odilon Redon, Frantisek Kupka (his early works), Alfred Kubin, Giovanni Segantini, and Max Klinger. These were followed close behind by the Secessionist visionaries - Gustav Klimt, Franz Von Stuck, Viteslaw Masek, and Jan Toorop. 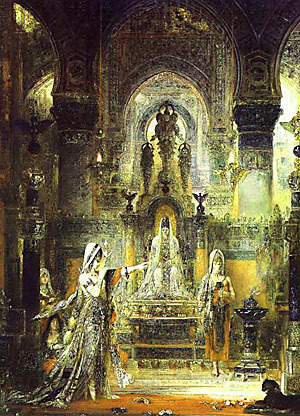 But, singular amongst all of these stands the timeless, transcendent and visionary art of Gustave Moreau.